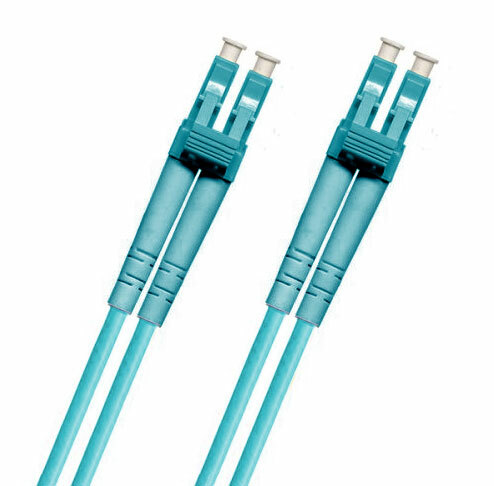 This is a LightWave LC-LC Multimode OM3 Fiber Optic Patch Cable is a duplex-style cable that is perfectly capable of handling even the most demanding telecommunications data transmission requirements, and utilizes the LC connector's compact, space-saving design that dominates the market today. Enjoy stable performance at a high level of quality with the LC-LC OM4 fiber optic cable. Experience data transfers over a 1Gbps link with a 50/125 micron glass fiber over a distance of up to 1000 meters at a wavelength of 850nm, and over a distance of up to 550 meters at a wavelength of 1300nm. For a 10Gbps link, you can transfer data over a distance of up to 300 meters at an 850nm wavelength. Each and every LightWave cable goes through rigorous inspection to ensure quality that meets customer demands, and the LC-LC fiber patch cable is no different. All parts and assembly are to industry standards, in order to bring you the best product possible. Individual test results are included with each cable.